Luke Wilton in action against Charlie Edwards. 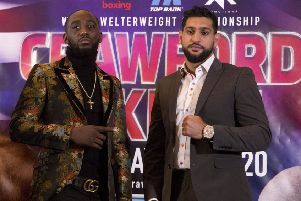 A six-fight card will play out in Belfast next month as the sport’s grassroots continue to thrive away from the bright lights and television screens. Boxing Ireland Promotions and Alio Wilton have teamed up with Scottish outfit Prospect Boxing to put on a card - ‘Back in Belfast’ - at the Shorts Sports and Recreation Club on the Holywood Road on Saturday, November 17. The packed undercard features five further fights - including two debuts. Young Larne super featherweight Kelvin McDonald has been making waves on the Ulster unlicensed scene and will make the step up on the bill. McDonald will be joined making his bow by Belfast super fly Cathy McAleer. Boxing Ireland Promotions boss Leonard Gunning said: “It’s been in the pipeline for a while, but I’m finally delighted to be ‘Back in Belfast’ on November 17 with Team Alio and Paul Graham of Prospect Boxing from Scotland at the Shorts Sports and Social Club. “We’ve run a number of shows in Dublin over the past 18 months so it’s great to be branching out into Belfast where the ‘Celtic Clash’ series began in 2013. Belfast is a huge boxing city and the home of pro boxing in Ireland, so we’ve wanted to go back there for a while, especially since Dennis Morrison returned from Australia. “I’ve always had a good relationship with Alan Wilton and we are in contact all the time so when he asked if we were interested in doing a co-promotion I jumped at the chance because he’s a guy I trust and respect. So I’m really excited to see what we can deliver and I’m sure November 17th is a going to be another great night. Tickets for the night are £30 (unreserved) and £40 (ringside) and are available from all the boxers involved.